You are currently browsing articles tagged Sandy Ground. 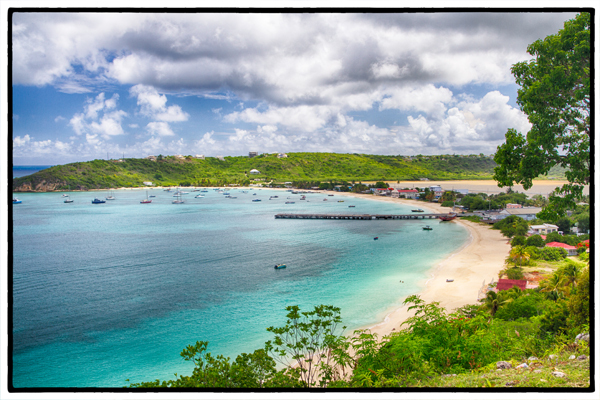 The view above Sandy Ground, Anguilla. Photo by David Lansing. Our band mates still hadn’t arrived so shortly after breakfast this morning, Mr. Glennis Connor, Anguila’s Patron Saint of Lost Luggage, pulled up in front of Cap Juluca to take Luscious and me to the dock where we were to catch a boat to Sandy Island. I still haven’t been able to get myself oriented on the island. All the roads twist and turn, going this way and that, and one minute the water is on your right side and the next it’s on your left, so it’s all very confusing to me. I started to ask Mr. Connor a question about the island’s history but he shut me down. We drove hither and thither and yon (I don’t think I’ve ever used that phrase before; it’s kind of nice) when suddenly Mr. Connor stopped the car along the side of the road. “I’m going to show you something but I don’t want you to ask me any questions about it,” he said. We were on a bluff looking out over a perfect Caribbean bay, the water six shades of green and blue, the hills an equal number of shades of green. Sailboats were anchored in the bay and a long dock extended like a bony finger across the green-blue water. Lovely. But nothing we could ask questions about.